Greenville, MS was a source of quite a number of soul records in the 60s. Artists like Frank Tenella, Vikki Styles, Maxine Thomas and Alice Thomas made fine sides there. 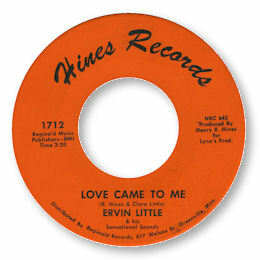 Another singer from the same location was Ervin Little whose four sides for Henry Hines’ eponymous label are strong southern soul. 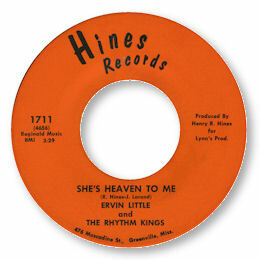 She’s Heaven To Me is the pick from his first 45 and it is a deep ballad typical of the genre. The fine slow tempo allows Little room to show off his big baritone voice and when the horns come in the song becomes even more powerful. The only pity is that the session had a bass player who was learning “on the job” if the number of fluffed notes is anything to go by. Even better than this track however was the outstanding Love Came To Me. I’m a real sucker for Bobby Bland styles soul blues and this cut is a beauty. The chord changes are lifted straight from “I’ll Take Care Of You” and the lead guitarist tries hard to sound like Wayne Bennett. But that certainly shouldn’t be taken as a criticism. Little’s impassioned vocal is full of gospel touches and hoarse phrases – lovely. The way the volume of the track is raised and lowered just adds the final touch to a really great cut. Thanks to Andy Aitchison for the suggestion.